CONFRONTING: Catherine McClements (centre) plays minister Clair in a Melbourne production of The Events, which comes to Geelong next month. A misguided young man opens fire on a local choir, blowing their community apart, in a confronting play coming to Geelong next month. 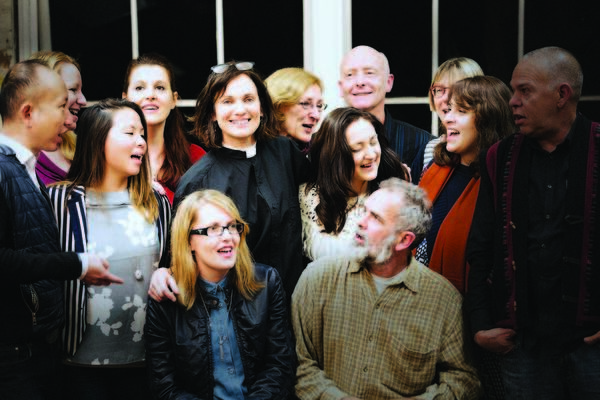 Prolific Australian actress Catherine McClements joins 25 singers from Geelong choir Raise the Bar in the musical play The Events. McClements plays Clair, a lesbian Anglican minister and director of a choir that meets regularly in a local hall, made up of outsiders and the privileged alike. But a young man enters with a semi-automatic weapon, shattering in seconds the multicultural community Clair took years to build. In the ensuing events Clair meets the figures who influenced the young man’s life. The play delves into the justification of his terrible shooting in the wake of recent ideological massacres in the US. Clair discovers a boy who is a voice of the alienated, an enemy within, a lost generation, and struggles with her own urges to repay murder with murder. McClements has played roles in scores of Australian TV series including Wentworth, The Secret Life of Us, Rake and Water Rats. The play comes to Geelong Performing Arts Centre for five performances from 11 to 14 July for its latest tour. Written by Scottish playwright David Greig, The Events is a co-production between Belvoir, Malthouse and State Theatre Company of South Australia. Previous articleFears for missing 14 y.o.